I am excited to share with you a sneak peek of all the new release products from Taylored Expressions. Today I will be sharing a project made using a new die called Basket Weave Cover Plate. This is a beautiful striped cover plate die which can be used as is as a striped die or use the stripes that fall out after cutting to weave back into the cover plate to get the basket weave pattern. How cool is that? I have one project where I have used the cover plate as it is and another card where I have weaved the fallen strips into the cover plate. For this card, I started with white card base. Then I inked an entire white card stock panel with Light to Dark Peach Ombre ink pad from Hero Arts. Once dry, I used the Basket Weave Cover Plate to die cut the panel. I saved the fallen strips to be used on the envelope. The die cut cover plate I adhered on the white card front. The focal panel is die cut using Stitched Rectangle Stacklets and white card stock. I stamped the images from Flippin’ Awesome stamp set and black heat embossed the sentiment also from the same stamp set. I LOVE the Flippin’ Awesome stamp set for its pun sentiments. And this set also has coordinating dies. Cool! Back to the card, I adhered this panel on the card front with some bunched up thread behind the focal panel. For the envelope, I adhered the fallen strips from the die cut and made a similar focal panel without the sentiment for writing the address on it. Then I also made a banner tag for the biscuit food packaging. The banner tag is made using the new Stitched Banner Stacklets. I die cut the bigger banner using Taylored Expressions Oreo cardstock. The smaller layered banner is die cut using the Sugar Cube cardstock. I stamped the dutch oven image and the sentiment heat embossed on top. 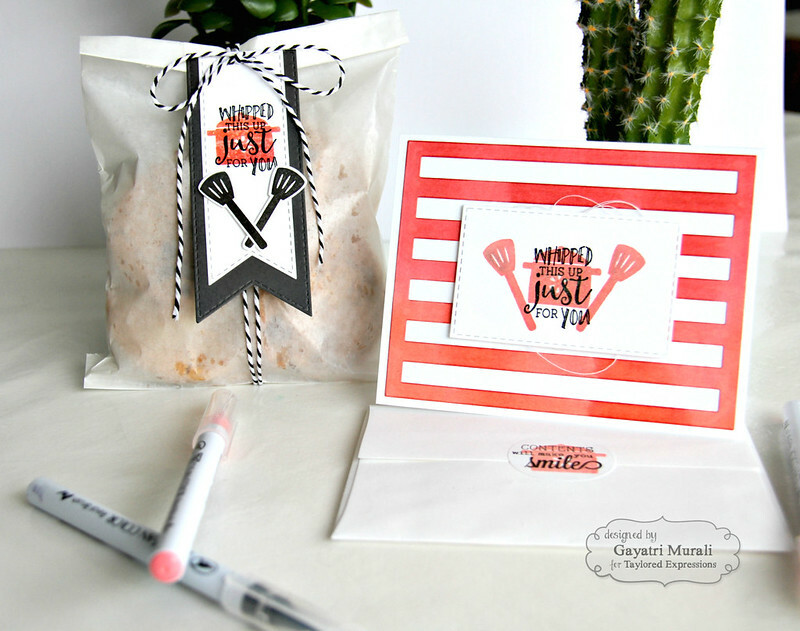 The spatulas I stamped in black and die cut using the coordinating dies. I wrapped the glassine bag with cookies with May Arts gold twine and through the two holes I made on the banner tag and made a bow. On the back of the envelope, I have a sticker on which I have stamped the sentiment from Sealed with Love stamp set. You can see it below. Next is a card that showcases the Basket Weave cover plate with the fallen strips woven into it. For this card, I inked the card front using Ripe Persimmon, Spiced Marmalade and Mustard Seed distress inks and spattered come clean water. Then I die cut the Basket Weave cover plate using Sugar Cube cardstock. I then weaved and glued the fallen strips leaving even space between them. I adhered this woven cover plate on the card front. For the focal point, I die cut a stitched rectangle panel using Oreo cardstock using the Stitched Rectangle Stacklets. 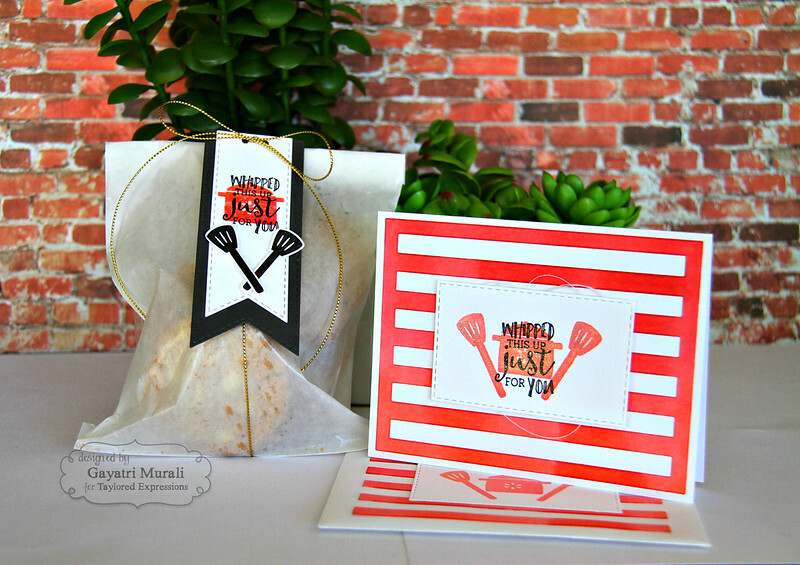 I white heat embossed the sentiment from Flippin’ Awesome stamp set. 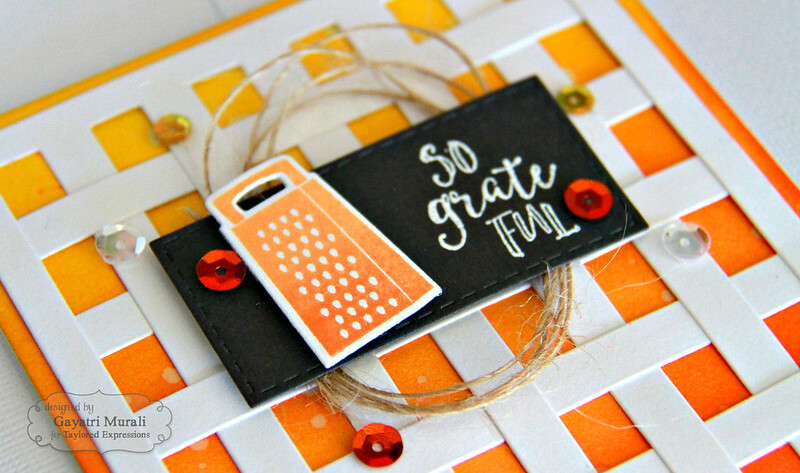 The grater also from the same stamp set stamped using the same Hero Arts ink pad and die cut using the coordinating die. I adhered this focal panel on to the card front with some jute twine behind. Then embellished with sequins from Build a Scene: Halloween. Here is a closeup of the card. How you you like the strips woven into the cover plate? You can die cut more of the strips and woven more closely as well. That will give you a traditional basket weave. Such a versatile is this cover plate? LOVE it! All new release products will be available for purchase from Taylored Expressions Store. These are both fabulous, Gayatri! Love the different looks you achieved with the basketweave CP! Love the So Grateful! Very creative!! Wow, your cards and tag are awesome. So simple but add that special touch to gift giving. Thanks for sharing. Love the clever use of basket weave plate, both of your creations are adorable!